One of the biggest passenger ships ever built - the cruise liner Queen Mary 2 - is in Greenock for the first time as part of her fifth birthday UK tour. 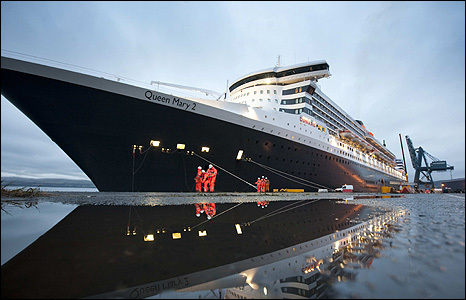 Cunard's 150,000-tonne flagship arrived at 0800 BST on Monday and will berth at Ocean Terminal until 1800 BST. A public viewing area will be open until 1600 BST and a firework display will be held before the ship sets sail. The 1,132 ft (345m) vessel cost £460m and was constructed at the Saint-Nazaire yard in France. Inverclyde provost, Michael McCormick said the visit would be a "great day" for the area. "We can all remember the amazing atmosphere when the QE2 came home to the Clyde for the last time and the thousands of people who came from all over to see her," he added. "I am sure this will be another memorable occasion for Inverclyde."